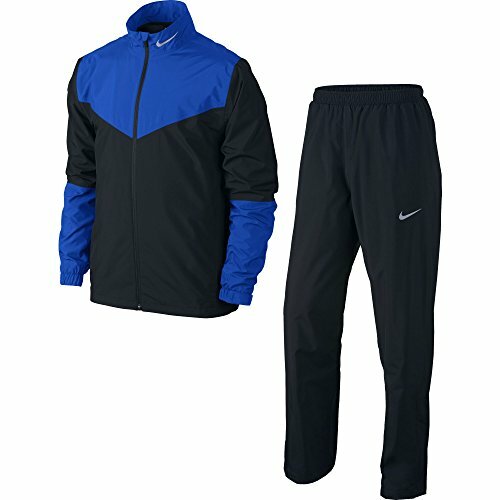 Mesh lining in jacket and pants provide breathability. Elastic waistband with interior drawcord on pants for an adjustable fit. Zip pockets on jacket and pant for secure storage. Zipper at pant hem provides ventilation and easy on/off. Body: 3.5oz. 100% polyester, storm-fit 2 layer ripstop. Upper back panel: 3.8oz. 100% polyester, storm-fit stretch woven. Content: Lining 65g; 100.0% polyesterwarp knit. Reflective heat transfer swoosh at mock neck and left leg. Standard fit for ultimate comfort for the modern golf athlete. Storm-fit fabric provides protection from the elements. Bonded seams repel wind and rain.